When Germany invaded Poland in 1939, the only neutral filmmaker in the country was Julien Bryan. His round-the-clock footage of Warsaw's destruction, assembled in Siege, is now again on view. 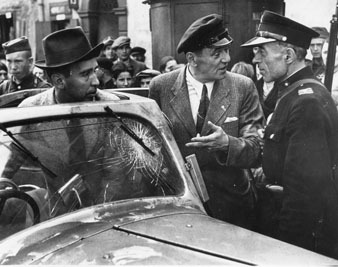 Julien Bryan (behind windshield) watches as his interpreter deals with a Warsaw policeman. Photo courtesy Sam Bryan. When Germany invaded Poland in September 1939, the only American, and in fact the only neutral filmmaker in the country, was Julien Bryan. He arrived in Warsaw in early September with a cache of roughly an hour’s worth of 35mm motion-picture negative. Given open access to the city by the mayor, he filmed day and night for two weeks, documenting Warsaw’s destruction and Germany’s inexorable advance. Back in New York he assembled the footage into a ten-minute newsreel called Siege. Released in February 1940, the film became for many viewers their first glimpses into Nazi tactics, the first visual proof of the horrors of modern warfare. Better known for his travelogues and educational films, Bryan had spent the summer of 1939 touring Switzerland and the Netherlands, gathering material to sell to newsreel companies and for his own productions. After purchasing his first 35mm camera sometime in 1930, he filmed throughout Europe and the Soviet Union, capturing everything from ethnic dances and rituals to landscape vistas. Bryan financed his travels in part by selling stock footage to Eastman Kodak, which marketed it to home consumers. He contributed material to eleven “March of Time” episodes, including the notorious Inside Nazi Germany, released in 1938. But he also put together his own documentaries, which he used on lecture tours. During World War I, Bryan volunteered with a French ambulance corps. His experiences on the front lines became the basis of a collection of essays and photographs, Ambulance 464, published in 1918. Bryan’s spell in France may have lulled him into a false sense of security during the summer of 1939. Like many observers, he believed the coming war would be a repeat of the last, a prolonged stalemate between entrenched forces. Warsaw would serve as his base camp in covering the fighting. What Bryan didn’t anticipate was exactly how far the German military would take the concept of total war. Before, soldiers in trenches bore the brunt of fighting. Now, civilians behind the lines were the target, and they were catastrophically unprepared to take on a professional war machine. Bryan filmed the desperate attempts by the Poles to barricade the city, men digging trenches across streets and stacking trolley tracks as defensive barriers. He showed German planes dropping incendiary bombs on apartment complexes, with the resulting fires, injuries and deaths. He photographed a church that had been bombed during a Sunday Mass, and a maternity hospital where mothers and infants huddled together in basement corridors. He even documented the destruction of the last film-processing lab in the city. In what he called the most tragic scene he ever photographed, Bryan showed children digging for potatoes in the same field where seven women had been machine-gunned to death moments before. Bryan filmed as an advocate, appalled, as he said later, at the brutality he witnessed. But he also approached the story with an eye on his market in the United States. His outtakes, available for view at the Steven Spielberg Film and Video Archive at the United States Holocaust Memorial Museum, in Washington, DC, include rough handheld shots of German planes, city blocks full of rubble, corpses in ditches or crushed by masonry–material he ultimately felt was too strong for mainstream viewers of the time. What may be most apparent in the footage today is his respect and admiration for the Poles. Where he initially tried to amass evidence, by the end of the film Bryan is focusing squarely on the victims, shown in a series of devastating portraits. He calls their faces “magnificent,” and they are. They are also doomed, the unspoken but obvious message behind Siege. How Bryan spirited the footage out of Poland, through Germany and back to the United States was an adventure in itself. Given permission to leave Poland with other visitors from neutral countries, he hid his film in some gas mask canisters purchased as souvenirs by an acquaintance. In one story a friend wrapped exposed footage around Bryan’s torso, under his clothes. Six weeks later, in New York City, Bryan assembled the footage for RKO newsreel producers Frederic Ullman Jr. and Frank Donovan. They added sound effects and a score, and recorded Bryan delivering a gripping narration. Despite its immediate impact, Siege was quickly supplanted in the marketplace by government-sponsored propaganda, notably the “Why We Fight” series, directed in part by Frank Capra and produced by the US Army Signal Corps. Capra even had editor William Hornbeck incorporate Bryan’s footage into documentary features like War Comes to America. The original 35mm version of Siege dropped out of sight. For years, the film was only available in battered 16mm dupes. Now, for the first time in decades, you can see Bryan’s film the way he intended, in copies struck from one of the few surviving 35mm prints. Working with the National Film Preservation Board and the National Holocaust Museum, Sam Bryan, Julien’s son, has been overseeing the restoration of his father’s work. New copies of Siege made from 35mm materials became available earlier this year, in time for Sam and his wife, Amy, to bring a print to Poland for some anniversary screenings in September. Amy was astonished at both the film’s reception and at the outpouring of affection for her husband. His father remains a national hero, the first filmmaker to bring news of the invasion to the outside world. The visit of Sam and Amy Bryan played out on the front pages of newspapers and on television broadcasts. Bryan was particularly moved by his reunion with Kazimiera Mika, seen as a bereaved ten-year-old girl in Siege. After the film’s initial release, Julien Bryan was hired by the Office of Coordinator of Inter-American Affairs. Like artists such as Walt Disney and Orson Welles, he was asked to make a series of short films on Latin America, part of the War Department’s attempt to build civilian support for our new allies once the United States entered the war. With funding from the Davella Mills Foundation, Bryan formed the International Film Foundation after the war ended, in 1945. He produced more than 200 films through the IFF, some shot by his son. Bryan returned to Poland in 1958, reuniting with many of the people he filmed. His visit resulted in a second book of photographs, this one on the survivors of the Warsaw siege. The Siege materials were contained in twenty cartons Bryan stored in a warehouse in New Jersey. As his son ruefully notes, his father’s work takes up some 800 additional cartons. Many of the films and photographs are in need of restoration, but funding remains a constant problem. The schedule for additional screenings of Siege can be found on The Film Foundation website. The film can also be viewed online at the Steven Spielberg Film and Video Archive at the United States Holocaust Memorial Museum.